A 3 day intensive review of basic equine knowledge and skills required to pass barn test and the National Trainers' Exam (Rules of Racing) as administered by Racing Commission stewards of racing states. Classes are most often conducted over three days, though occasionally may be two half days and two full days. To see possible classes and locations for 2011 click on the link below. The Elite Program, Inc. provides education services for horsemen with primary emphasis on horsemen involved with racing and racehorses. In 2010 Groom Elite 101 and/or 201 classes were taught at Gulfstream Park, Santa Rosa Park (Trinidad-Tobago), Penn National, Indiana Downs, Churchill Downs, Charles Town, Colonial Downs, Canterbury Park, Philadelphia Park and Calder Race Course. For more information about future classes check out THE GROOM ELITE PROGRAM'S WEBSITE. The Thoroughbred Retirement Foundation-South Carolina established a TRF unit at Wateree Correctional facility near Camden, SC. South Carolina TRF and The Elite Program established a Farm Elite vocational course called Second Chances Farm Groom Elite that is a model for other rehabilitation programs that utilize retired racehorses. 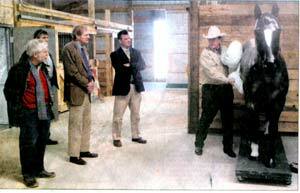 In the picture to left, I am demonstrating location of a horse's cecum to the Director of the SC prison system and other important backers of this program. Wateree correctional has graduated 88 grooms through 2010. James River Work Center in Goochland, Virginia became the second TRF facility to use Groom Elite for their vocational training of inmates. They took in their first horses in September of 2007. Sykesville Prison in Maryland had their first training class in August of 2009 and Plymouth County (MA) Sheriff's Department opened a Second Chances Groom Elite program in February of 2010. 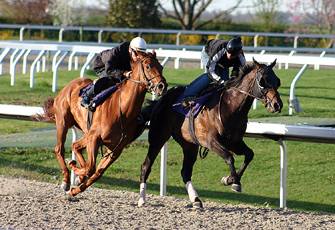 I use my breeding and genetics education, over 20 years of teaching trainers and my own training experience as background to help new owners get started in horse racing; select yearlings and two-year olds in training; advise on claiming and training programs and evaluate potential matings. ATTENTION: - I am available to assist with evaluation of racing and/or breeding prospects at any of the sales in Kentucky on short notice and other sales with ample notification. If you have questions about your current training program or desire help with slecting racing prospects (purchase or claiming), Email Me for information regarding services and fees. This picture is of Covington Woods in the Remington Park winners circle after he set the Equitrack record for 10 furlongs on my 45th birthday. "Duke" was claimed for $4000 and subsequently won 4 races after being switched to turf where he also set the RP course record for 11 furlongs in 1990. HOW TO PLAY THE "HORSERACING GAME"
The object of any game is to WIN. Don't forget to PLACE that bet.